Throughout the Puget Sound basin early this month, a thick layer of smoke blotted out the sun, and ash fell like snow. People had to brush their windshields off before attempting to drive; air quality ranged from unhealthy to hazardous. The flecks and haze were fallout from wildfires burning in central and southern British Columbia and eastern Washington; vast tracts of northern Oregon were also in flames. The province and the states are experiencing their warmest, driest summers and worst fire seasons in recorded history. The Eagle Creek fire just east of Portland even jumped one of the largest rivers on the continent: the Columbia. It crossed state lines and fled. At the same time, hurricanes Harvey, Irma and Maria were blowing one gale after another, snapping power lines and flooding homes and highways in Houston, the Florida Keys and Puerto Rico. Too little water in the Pacific Northwest; too much water in the Gulf Coast and the Caribbean. Climate change is visiting plagues of Biblical proportions upon us. But we, like the Pharaoh, refuse to relent. Human beings are extremely bad at understanding probability. Our brains are much better at grasping yeses and nos; clear causes and clear effects. But climate scientists are finally beginning to communicate what is going on in a way that we all can understand. Heidi Cullen, for example, has pointed out that doctors can’t definitively attribute any single case of lung cancer to cigarette smoking. But we know beyond a reasonable doubt that smoking makes lung cancer much more likely. Smoking “causes” it. The same thing is happening with global warming. Forest fires and hurricanes are getting more frequent and are higher intensity than in the past, because we’re pumping so much CO2 into the air. The trapped heat makes hurricane season in the Atlantic more likely to be ferocious, and the fire season in the Pacific Northwest more likely to be deadly. The exhaust pipes of our cars and home furnaces are like cigarettes. It’s as if the whole world is smoking. Judy gathering the bittersweet that Scott just yanked out of the creek bed to add to the growing mound. The twine-looking bits are roots. At Tarboo Creek, we think about this new normal globally. But beyond campaigning and voting and living the lowest impact lifestyle we can, there is not much we can do. We could only watch helplessly as our country pulled out of the Paris climate accords. We are not helpless about the state of Tarboo Creek, however, so we act locally. Warming ocean temperatures are making life worse for adult coho and chum salmon in the Pacific, but we can work on our little creek to create a tiny offset: better habitat for their offspring. That is what we have done this summer, starting in August and finishing now. 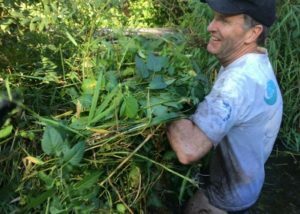 We removed an invasive plant that was new to our little stretch of creek—a bad actor called European bittersweet. It grows as a vine, with bare roots forming netlike mats in the creek channel and leafy stalks snaking over the bank, often up and over nearby trees and shrubs. Its fiendish plan was working to perfection: during our late summer drought, the bittersweet was drinking creek water and overgrowing native species parched nearby. We developed a system for clearing bittersweet. I strip to my skivvies and T-shirt, then wade in the stream channel while my wife, Susan, and sister Judy work the bank. 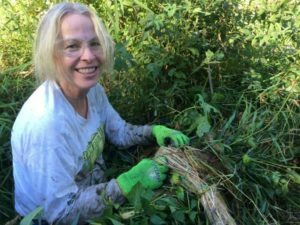 I dislodge the loosely anchored root masses, hug them to my chest until enough water drains away to lighten the load, and then pass them up to Judy and Susan, who roll them up with the vines they’ve torn off the bankside vegetation. Eventually we build mounds of ripped-up bittersweet, dotted along the creek like Monet’s haymows. I learned, through trial and error, to do the wet work barefoot—to neutralize mucky parts of the creek bottom that suction shoes or sandals into a death grip. It’s immensely satisfying: in just hours we can transform a stretch of choked channel into a clear and steady flow. But the best part is walking upstream, from one bittersweet patch to another. In all our years of working on the creek, I’d never done this before: seeing the stream like a fish, stepping over downed woody debris, relishing the cool shade from willows and alders and cedars that we planted years ago. So I keep my head down, and work. If I look up, into another day of ash fall and haze, I will despair.